Glaucus was a sea-god from the ancient Greek pantheon. Glaucus though, was an uncommon god, for Glaucus was born a mortal. It was commonly said that Glaucus was a fisherman from Anthedon in Boeotia, although there is no consensus upon the parentage of Glaucus. Individuals named Copeus, Polybus and Anthedon were all named as father of Glaucus. Alternatively, Glaucus might have been the mortal offspring of a god, for both Nereus and Poseidon were occasionally named the father of the fisherman Glaucus. Having caught some fish, Glaucus covered his catch in some herbs he had found nearby, but Glaucus was amazed to find that the herb brought the fish back to life. Glaucus decided to eat the herb, and it was this consumption that turned Glaucus from a mortal into an immortal. This herb was later said to have been found by Glaucus upon the island of (Sicily) and was the never-dying herb planted by Cronus, and used by Helios as feed for his chariot pulling horses. Alternative stories are given for the transformation of Glaucus in ancient sources, for it was also said that at one time Glaucus was the hero who steered the Argo. During a sea battle, Glaucus was knocked overboard, and sank to the seabed, where, by the will of Zeus, Glaucus was transformed into a sea-god. Another version of the story of the transformation of Glaucus, sees the fisherman chasing a hare for food, with the hare being brought back to life when Glaucus rubbed the hare in some grass. Subsequently, Glaucus tasted the grass, but eating caused a madness to take over the fisherman, and it was during this madness that Glaucus threw himself into the sea, and was thus transformed. The eating of the herb did not just make Glaucus immortal, for it also changed the appearance of the fisherman, and in the place of his legs grew the tale of a fish, his hair turned copper green in colour, whilst his skin turned blue; thus Glaucus had the appearance of what today would be called a merman. 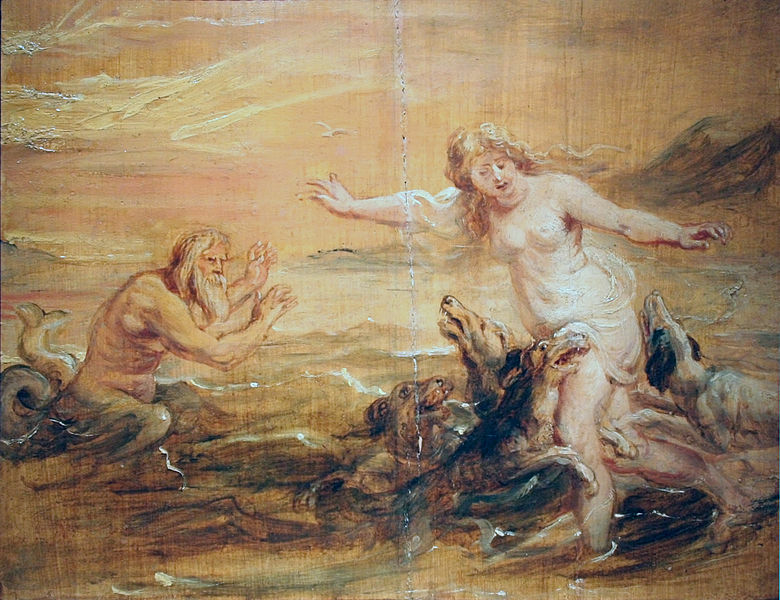 The transformation of Glaucus, both in terms of immortality and appearance, greatly upset the fisherman, but Oceanus and Tethys came to his rescue, and soon Glaucus learned the way of the other sea deities, and from the other sea-gods, Glaucus was soon well versed in the art of prophecy, and it was said that Glaucus would outstrip all of his tutors in ability. In the surviving versions of the adventures of the Argonauts, Glaucus does appear, but his appearances are in relation to his interaction with the Argonauts, not his transformation. Some tell of sacrifices being made to Glaucus before departure from Iolcus, and certainly Glaucus appeared to the Argonauts during the voyage of the Argo. It was said that Glaucus appeared after Orpheus had offered up prayers when the Argo was caught in a storm. Glaucus stilled the wind and waves, and then accompanied the Argo for two days, foretelling the futures of various Argonauts. After the disappearance of Hylas, and the abandoning of Heracles and Polyphemus, it was also Glaucus who appeared to bring peace between Jason and Telamon. For Glaucus told the Argonauts that all that had thus happened had been ordained by the gods, and was not the fault of Jason. In some tales it was also Glaucus, a generation later, who informed Menelaus of the passing of his brother Agamemnon, as Menelaus sailed home to Sparta. Ancient sources tell of Glaucus being both a herald of Nereus and Poseidon, but Glaucus was especially known as being a friend of fishermen and sailors; and it was often said that Glaucus would rescue those washed overboard from their vessels. It was said that Glaucus’ home was to be found near to the isle of Delos, where he resided with some Nereids. From here Glaucus would utter his prophecies, which were then carried forth by the water nymphs. The prophecies of Glaucus were highly regarded by fishermen, for it was known that they were trustworthy. It was also said that Glaucus would venture forth once a year to bring his prophecies personally to the islands and coastlines of Ancient Greece. It was said that Scylla would bathe in a small cove, there she was spied by Glaucus, who was taken by the beauty of Scylla. Coming closer to make himself known to the water nymph, Glaucus only succeeded in frightening Scylla, who fled from the sight of him. Glaucus went to the sorceress Circe, and requested a potion by which Scylla would fall in love with him. Circe though had herself fallen in love with Glaucus, and so rather a love potion, Circe gave Glaucus a potion which transformed Scylla into the monster. Alternatively Circe poisoned the waters into which Scylla bathed, transforming her into the famous sea monster. Some also tell of Glaucus’ attempts to woo Ariadne after Theseus had abandoned the daughter of King Minos upon the island of Naxos. Ariadne though was also desired by Dionysus, and a brief struggle between Glaucus and Dionysus followed. Glaucus and Dionysus would eventually part on good terms, and Ariadne would of course marry Dionysus. 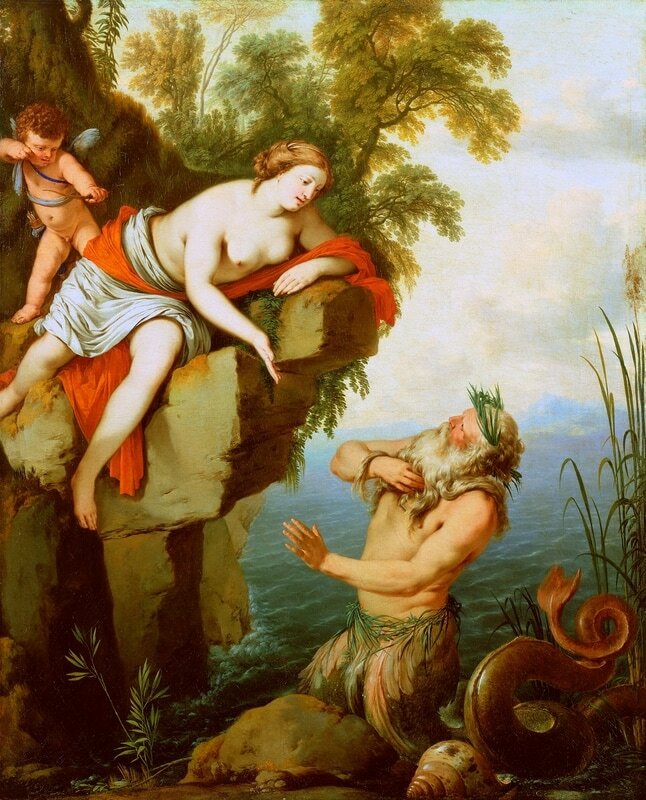 It was also said that Glaucus abducted Syme, the daughter of Ialysus, ruler of Rhodes, and took her to an uninhabited island, where Syme became the lover of the sea god. This uninhabited island in the South Aegean would be named Syme, after his lover, by Glaucus. There is the possibility that Glaucus was the father of Deiphobe, the long-lived Cumaean Sibyl encountered by Aeneas.